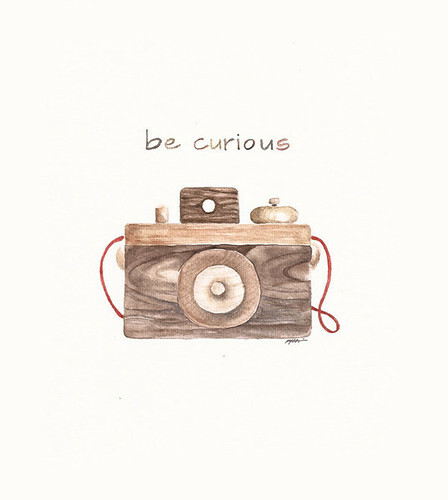 Put a camera in your child's hand and curiosity will overflow! Each time my little ones take my iPhone (or Nikon!) and snap, snap, snap around the house, mundane objects and boring rooms suddenly beg for the camera's attention. The bathroom, dishes, doorknobs, (blurred) fingers, a closet, or the pattern on a simple door mat - they all become irresistible subjects. Taking pictures is fun and it's something our little ones see us do everyday, so it's natural for them to want to copy us and document their own surroundings. And that's why I'm so pleased that Brimful offers such a lovely, sturdy, "first" camera. And it's even more pleasing to see that you love our camera as much as we do! Based on it's popularity, Annie and I wanted to have a special print made of this toy. A tremendous THANK YOU to Ruth Simons of GraceLaced for the beautiful watercolor print she created for us. I imagine this print hanging in a child's room or play room, and when they are old enough pointing and saying "That's my camera!" before they dash off to find said toy and play photographer all over again.